Our blog comes from our Director – Melissa and it’s about food, which I know we all love here at Pexel! Being a Malaysian, food is more than just fuel. It represents a blend of cultures from a very diverse country. There are influences and similarities with Indonesian and Singaporean cuisine, due to the geographical proximity of the countries. In Malaysia, food is available 24 hours a day (and I don’t mean a McDonald’s drivethrough!). There is also a social aspect to food – meet ups would often revolve around food and it’s not uncommon to share lots of dishes, like you do with tapas. There are a few places in Glasgow that you can try Malaysian cuisine. If you ever get a chance to go and wonder what you should try, here are my top 5 favourite dishes from home. This is our version of an All Day Breakfast. Rice for breakfast may be a strange concept, but not for Malaysians! Nasi lemak is widely regarded as our national dish and translates into ‘fatty rice’ simply because it is creamy as the rice is cooked in coconut milk and infused with pandan leaves (which is commonly used in Malay cooking). The rice is typically served with a spicy red sauce called ‘sambal’, cucumber slices, fried anchovies, roasted peanuts and a hard-boiled or fried egg. Add ons can include fried chicken or beef ‘rendang’, which can be described as a dry spicy curry. Satay is basically skewered meat, glazed with a sauce and barbecued over hot charcoal to give it a smoky taste. The most common meats used in satay are chicken and beef. The accompaniments that go with satay are cubed rice, cucumber slices and most importantly, a peanut sauce. ‘Nasi goreng’ or fried rice, has lots of different variations, as certain mixtures, ingredients and toppings could lead to another recipe of nasi goreng. The taste is usually spicier compared to Chinese fried rice. It is often eaten with a fried egg on top, accompanied by some ‘keropok’, which are fish crackers (instead of prawn crackers). In fact, it could also be served with a couple of sticks of satay to pimp up the dish! This dish literally translates into ‘stir-fried ricecake strips’, taken from the Hokkien dialect and is from the South East Asian Chinese origin. 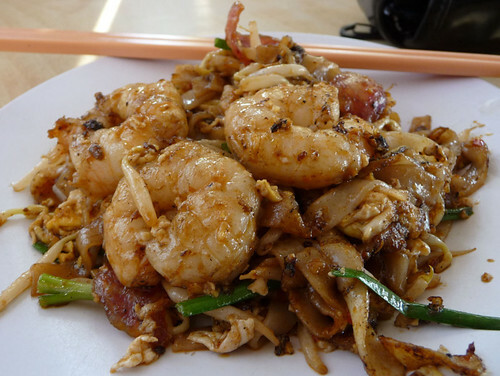 Char Kway Teow is usually cooked with light and dark soy sauce, chilli, ‘belacan’ (shrimp paste), prawns, cockles and bean sprouts. Though I’m not a massive fan of cockles so I always ask for mine without! Now, I’m partial to a good plate of Hainanese chicken rice. I am Hainanese, after all, as my great-grandparents come from a tiny island called Hainan Island in China. So whilst this dish originates from China, the Chinese immigrants who came to Malaysia to work in the tin mines in the 1820’s adapted the dish with what they could source locally. The whole chicken is poached, with the resulting stock used to cook the rice for added flavour. The chicken is served with a dash of soy sauce and sesame oil, as well as a dipping sauce made from red chillies, garlic and ginger. I could go on and on – there are plenty more I could add to the list, but just writing about this has made me hungry! In French, you would say ‘Bon Appetite’ but I don’t think there’s a Malaysian equivalent because we usually just wolf down the food before anyone says ‘Let’s eat!’.